Doodlecraft: Alien Monster Cookie Dough Bites! Alien Monster Cookie Dough Bites! 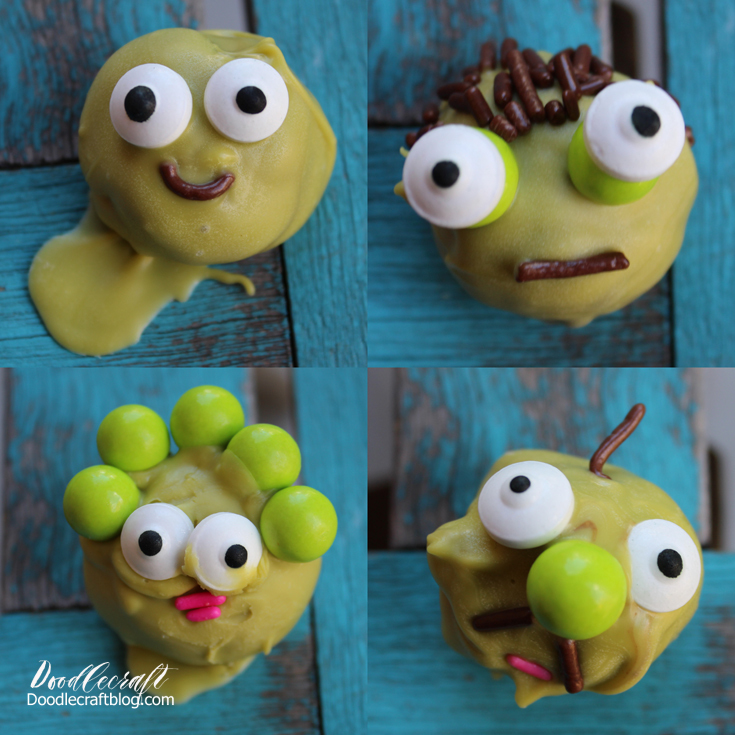 These little silly faces are a fun for a little Halloween treat! These are fun for littles to help decorate! My kids are older...like I have a teenager, a tween and my baby is 8! get in on decorating these adorable and terrifying faces! You will need some sprinkles, candy eyeballs and candy melts. then add in the chocolate and stir in. Melt the dipping wafers in a glass dish. Then roll the bites in the chocolate coating and place on your baking sheet. The chocolate coating dries fast! Add sprinkles and whatever fun you have! I let my kids each take turns decorating a few. Admire those sloppy silly faces! The beauty of these treats is you don't have to have perfection! Let them sit in oozy pools of their own slime! Let them have goopy goobers in their eyes! It's worth it and they taste the same! Extra eyes, only one! It is so much fun! Great for a silly school treat or a dessert for a Halloween party! Tastes great and looks funny! You'll get lots of compliments on this dessert tray!